All Berkeley homes currently listed for sale in Berkeley as of 04/18/2019 are shown below. You can change the search criteria at any time by pressing the 'Change Search' button below. If you have any questions or you would like more information about any Berkeley homes for sale or other Berkeley real estate, please contact us and one of our knowledgeable Berkeley REALTORS® would be pleased to assist you. "Find your home in this great Claremont location near Elmwood, and Rockridge - Ideal for entertainment and filled with warm living spaces. You will feel the expansive, peaceful qualities of this property as soon as you come in for a visit. Sunshine fills the formal rooms; box-beams & period lighting fixtures accent 10 ceilings. Beautiful original details enhance an easy floor plan with lots of bonus space: mahogany-paneled walls and railings, luster sconces & oak wainscoting, Art Nouveau windows and intricate inlaid oak floors. A sunroom offers a lovely garden retreat; a bright eat-in kitchen suite has a butler s pantry & au-pair space. Upstairs, 9 coved ceilings & wide hallways extend to a spacious master suite with bath & large sunroom, a meditation room, fabulous corner bedroom, four more bedrooms & two decks, open to views of the Hills & Claremont Hotel. Large windowed basement & attic with deck, wide lawns & garden. Just blocks from UC Berkeley, bus & BART to San Francisco." "Open the gate and enter your own private paradise! Home is beautifully sited on 3 parcels that wrap around the home, providing a park-like setting with privacy and serenity. There are spacious natural lawn areas, gardens, room to play, to dream and get away from it all, a tennis court and stupendous Bay views! The house itself is a treasure...comfortable and elegant and designed with practicality in mind. There is a classic paneled library with fireplace, a sun-room overlooking the grounds, a cozy family room with river rock fireplace adjacent to the eat-in chef's kitchen. The master bedroom suite is beautiful, luxurious and looks directly out to the Golden Gate Bridge. A dramatic attic room offers a Tahoe-like place for exercise, television, children's play and star gazing. While secluded and private, there is easy access to hiking trails, close to BART and the Trans-bay Express bus, tennis clubs, U.C. Berkeley and fine restaurants. One-of-a-kind!" "Sitting atop the pinnacle of the Claremont Hills in Berkeley, this architecturally modern gem begs your attention. Located at the end of a quiet and secluded street with only handful of neighbors around you, the stresses of daily life will melt away. Lose yourself in the stunning and unparalleled views of the San Francisco Bay Area, the Oakland and San Francisco skylines or the San Francisco Bay Bridge. Easily entertain your friends or family in the custom movie theater or better yet on the huge private balconies. Conveniently located to major freeways and interchanges, downtown Berkeley and Rockridge and close proximity to top rated public and private schools makes this home a MUST-HAVE for most discerning buyer." "Exceptional Mid-Century Jewel designed for one level living by Berkeley Architect John Ballantine with 74 Walkscore. Three full bedrooms on the main level including the master suite as well as a period-perfect wood-paneled office with intact wet bar. Spacious, eat-in Chef s kitchen with updated stainless appliances, generously proportioned living & dining rooms with cathedral ceilings flowing through glass doors directly onto the patio - perfect for large gatherings and entertaining. Lower level en-suite, additional rumpus area and expansive storage. Access the property from Tanglewood or by private road leading to the sizable two car garage. Ideally located just blocks from The Claremont Hotel & Spa, College Avenue shops and restaurants, and the Claremont Canyon Hiking Trails. Close to UC Berkeley, public transport. Rare opportunity. Open Sat/Sun 4/20&21 2-4:30pm"
"Romantic, artistic Mediterranean on a quiet street in coveted Thousand Oaks. Jarvis Architects magnificent remodel and master suite addition are perfect for the most discriminating buyers. Large LR, enchanting garden with ponds, waterfall and large boulders. The FDR is adorned with a lighted leaded glass display cabinet. The chef's kitchen with SS appliances, granite counters, large central island has a door to the yard. The magnificent, imaginative 2.5 bathrooms enjoy gorgeous tile work including a lemon tree mosaic. The private master bedroom has a deck with lovely views. A sun room adjoins a bedroom. The 3rd bedroom is perfect for guests or study. The gorgeous detail features architectural arch ways throughout. The many windows bask the interior with sunlight. The hardwood floors are gleaming. Sewer compliant." "Grand Berkeley brown shingle from the early 1900's. Tax records show 1908. City records show 1910. In either case it's 100+ years young. Since purchased by current clients in 04/2015 home has gone through an extensive transformation starting with the owned solar panels, a new roof, 2 level heating system, tank-less water heater, complete bathroom remodels, addition of closets, room enlargement, doorway added, floors refinished, all new lighting appliances and ceiling fans, Wolff oven-range, Bosch dishwasher, earthquake retrofit, new sections of foundation, new exterior paint, new interior paint, new shingles, new basement flooring with drainage, new hardwood floors in kitchen, refinished kitchen cabinets and adjacent area, new exterior doors, designer landscaped front yard. All work architect designed and with permits. Plus you can walk to Solano or the Gourmet Ghetto, see the Bay from the master bedroom window and enjoy the warmth of 2 fireplaces. Come see this unique property." "A fine example of mid-century architecture by Robert Ratcliff with splendid updating and glorious gardens! Level entry, bright open main level. Upper level family room with fireplace, large office and 3 bedrooms. A gem in the coveted Thousand Oaks neighborhood!" "Beautiful Craftsman 4 Bedroom 3 Bath home. Gracious entry with built-ins, leads to open living & dining rooms, large updated chef's kitchen w/island, deck w/views. Gleaming hardwood floors throughout. Perfect indoor/outdoor spaces for entertaining. Master suite with sliding doors to private deck with views, two large walk-in closets, luxurious bathroom, jetted tub with canyon views, separate marble-tiled shower. Two more bedrooms and bath, laundry room, game room and hidden wine room. Two car garage, gorgeous views of Claremont Canyon Regional Preserve, and steps away from hiking trails. Minutes to Claremont Club & Spa, Rockridge shops, restaurants, and BART." "Located in the Claremont neighborhood, one of Berkeley's most prized locations, this home is ultimately convenient yet exceedingly private. This mid-century gem was built in 1970 by known architect, L. Chamberlain, who defined the home by creating gracious proportions that integrated beautifully in the surrounding creek side setting. Three spacious bedrooms and three full bathrooms, including master suite, and lovely, lower level bedroom with bath and adjacent large family room with both interior and exterior access. The large living room with soaring ceilings has built in storage and a magnificent fireplace. Formal dining room, also with built ins and eat in kitchen. Indoor-outdoor flow with terraced patio backyard and many decks overlooking a magical creek side setting. Convenient to shops, restaurants and transportation." "From the moment you enter, you will be struck by the amazing views and beautiful hardwood floors, high ceilings and custom paint colors. The main level features a gourmet kitchen and over-sized living and dining room, which are completely accessible to the huge deck allowing for indoor-outdoor entertaining. In addition, there is a full bathroom and large laundry room with plenty of storage. Upstairs, you will find a gigantic master suite with over 600 square feet. This private oasis features full southern exposure to the panoramic views, two large closets and a luxurious bathroom with double sinks and rain fall shower. In addition, there are two other spacious bedrooms sharing a Jack & Jill full bathroom. Downstairs, you will find another large master suite with bay views, two closets and a full bathroom with double sinks and jetted tub. In addition, there are two bedrooms and another bathroom with laundry. This floor has it s own separate entrance, a living room with kitchen. Views: Downtown"
"Near Campus with an exceptionally secluded creek-side setting, this magnificent Maybeck designed photo gallery and studio is one of Berkeley's architectural treasures! Level in to the gallery space or home office, and proceed down the broad stair to the great room, where Oscar Maurer crested masterpieces in the early 1900's and where natural light pours in from the spectacular leaded glass window. The kitchen opens to the deck overlooking the cascading waterfall and creek and leads to the separate bedroom suite. Truly a rare work of art to call home!" "Enjoy the perfectly framed view of San Francisco from this special private sanctuary. Nestled above scenic La Loma Park and built in 1955, this mid century masterpiece was thoughtfully designed by renowned architect Gerald McCue for his family. This classic piece of Berkeley history sits on a double lot and is all on one level with clean mid century lines and seamless indoor - outdoor flow. Main house has 4 bedrooms and 2 bathroom with magnificent views from every room. Kitchen looks out to beautiful garden patio and eating area. Separate studio/office with kitchenette and full bath, below two car garage. Property opens to La Loma Park. Extremely special setting. Convenient location: 5 minute drive to North Berkeley shops, just 1.3 miles. Close to U.C. Berkeley Campus 1.5 miles but feels a world away! Several magical parks, special views and paths to enjoy close by." 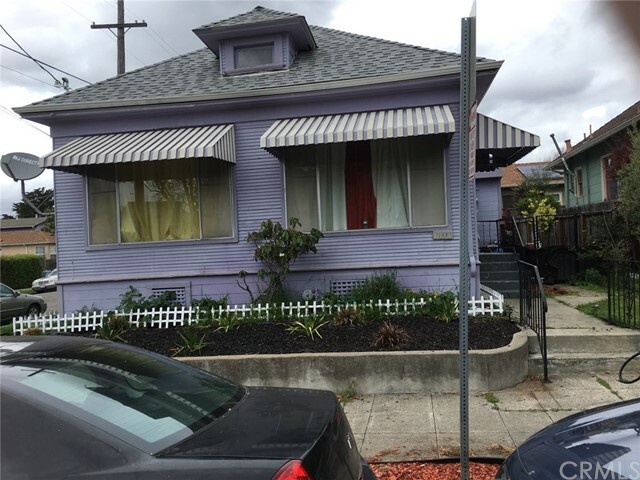 "A San Francisco Bay view house with potential, much deferred maintenance, possible room for expansion. For viewing please contact listing agent." "This modern home has splendid bay views from both levels. There is a huge great room dining room/living room with huge fireplace/den combo, enormous eat-in kitchen, awesome master suite with huge media room with wood burning stove, two additional bedrooms. 2 car garage. Not far up the hill from Claremont. Great location for commutes, Elmwood and Montclair and Rockridge. Views: Downtown"
"Level in home nestled behind a privacy wall on an expansive lot with stunning views of Golden Gate and San Francisco. Architecturally unique with a nod towards the art-deco era with all the right curves. A spacious open living/dining room leads to a sizable deck. You'll find three bedrooms including an expansive master retreat and private deck for more dreamy views. Lower level can function as an extension of your home with guest quarters including one bedroom, bathroom, family room and wet bar. A gentle sloping rear yard offers tons of fun for everyone to play, plant and relax. Just a short distance to North Berkeley s Gourmet Ghetto, top rated schools and numerous hiking trails. You will fall in love! Open Sat & Sun 2-4:30pm." "Chic Contemporary with Great View! Upon entering is the gorgeous living room with fireplace and sunken dining room (also with fireplace) with access to the great upper deck area with beautiful bay views. Upstairs is a large eat-in kitchen, and master bedroom. Downstairs, there are two large bedrooms and large, full bathroom, as well as a bonus room with garage access. There is a lovely front yard area, and just a great feel to the entire property. Located in the highly desirable Claremont Knolls." "LAST CHANCE! Limited time to make an offer on this amazing owner-occupier gem! This stylish Poet's Corner gem is set on a quiet street minutes from University Ave, Fourth Street shops & restaurants, parks, UC Berkeley and BART. Amazing opportunity for owner occupied investment property consisting of a stand-alone front owner s residence with duplex in the back. The chic and modern owner s residence has undergone an extraordinary transformation inside and out to create a Dwell style home. Updates include a private front garden patio area, new windows, kitchen with Wolf gas range and top grade appliances, stylish bath with oversized & frameless glass shower, custom concrete look tile, refinished wood floors and more. The back tenant occupied duplex includes two one bedroom/one bath units. Two carports provide off street parking. Four large storage areas/laundry rooms offer bonus space. Let the rent help cover the mortgage payment and build future income." "Classic Tudor style home with sweeping Bay views. Living room with dramatic, vaulted ceiling, spectacular view, fireplace with herring bone brick design and original mantle, formal dining room, updated kitchen, hardwood floors throughout, original casement windows, basement with large, useable room, extra storage room, fantastic landscaped yard with newer stone patio, decks on two levels, one rebuilt, one recently built to take advantage of view. Many recent improvements including replacement of part of foundation and extensive retrofitting. Close to buslines, Tilden Park, and Kensington Village." "This 1319 sqft. exquisitely remodeled 1922 classic craftsman features 3 br 2 1/2 bath, recently renovated from 2017-2018. Modern and open floor plan which is great for entertaining. This home has an additional detached finished building which can be used as an office space, workshop, or anything you can imagine. The spacious master suite includes updated bathroom fixtures and dual sinks. The gorgeous kitchen includes two sinks, stainless steel appliances, marble countertops and a gourmet gas stove. There is a lovely gas fireplace in the living which opens up to the dining room. Some of the improvements include: Updated systems, appliances, windows ceiling fans and skylights, new dual pane windows, ceramic and hardwood floors, efficient forced air heating and beautiful gas fireplace. Completely fenced backyard, abundant street parking with a short walk to Berkeley Bowl West, and San Pablo Park. Perfect for those wanting a short commute to San Francisco and Oakland!" "First time on the market in more than 30 years, this 1911 traditional Berkeley home is filled with charming original details. Oak floors with inlaid borders on the main level and Fir floors upstairs. Fireplace in the Dining room. Spacious hallways, high coved ceilings and numerous windows on all sides creates a feeling of air, space and light. At the rear is a sweet backyard bordered by Palm and fruit trees and a cute shed for storage or hobbies. The front of the house is framed with a blooming Fig and Ginko tree. Close to Berkeley Bowl, Whole Foods, Temescal restaurant row, Elmwood shops, UC and BART. Super location with Paradise bike score and great walk score. Perfect for someone who wants to add their own personal touch." "Captivating 3-BR/1.5BA central Berkeley beauty! Two-story, light and airy with original Colonial Revival architectural details, welcoming living room with coved ceiling and hardwood floors, formal dining room with fireplace and period detail, refreshed eat-in kitchen with wonderful indoor-outdoor flow to spacious gardens - and more! On a quiet, tree-lined street, just blocks to both vibrant Shattuck and University avenues, BART, SF Express and UCB. Walk score of 81, Bike score of 97!" "Classic 1906 S Berkeley Bungalow, Spacious 1296 sqft home on corner lot. Upgrades include solar panels, newer roof and more. Great central location, 8 blocks from Downtown Berkeley, 11 blocks to UC Berkeley, walk to nearby parks, shopping, Whole Foods Market and schools. Easy access to I-580 and Oakland-San Francisco Bay Bridge." "Exceptional Mediterranean bungalow in superb central location. Handsome living & dining rooms w/original architectural detail, sunny bedrooms, updated bathrooms, beautifully refreshed kitchen, breakfast nook w/built-ins, home office, art studio, magnificent garden. Blocks to BART, neighborhood cafes!"